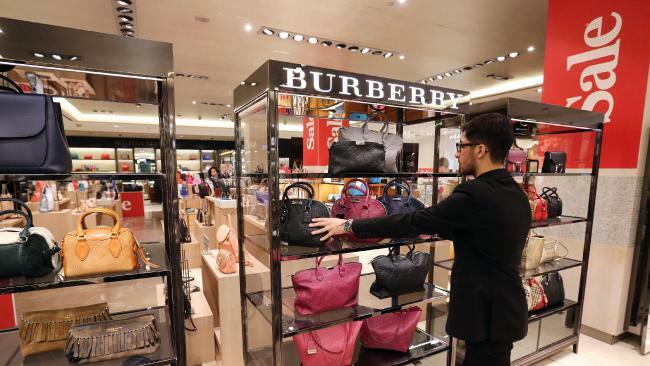 An employee arranges a display of women's handbags in the Burberry Group in Moscow, Russia. Picture: Andrey Rudakov/Bloomberg. 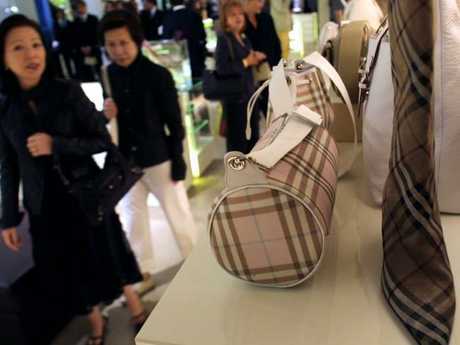 LUXURY British fashion house Burberry destroyed tens of millions of dollars worth of its fashion and cosmetic products over the past year to protect its brand. The company burned unsold clothes, accessories and perfume worth £28.6 million (AU$50.5 million), according to its annual report, in a practice now common across the industry to guard against counterfeiting. The traditional Burberry plaid on display at a Burberry store in Milan, Italy. Picture: Bloomberg News. Among the products destroyed were £10.4 million (AU$18.4 million) worth of beauty items, which Burberry said was a one-off related to a licence it agreed with beauty company Coty last year. The firm - which announced a slight rise in annual profits in May to £294 million (AU$520 million) - has said it takes its environmental obligations seriously and harnesses the energy from burning the items. Politician Tim Farron, environment spokesman for the opposition Liberal Democrat party, said: "It is outrageous that Burberry think setting fire to their unsold stock is an acceptable solution." Noting recycling was "far better for the environment", he added: "As a leading British fashion brand they should be leading the way in sustainable fashion."